Thanks to my good friend Steve Lindhorst from genuine seller, I gave eBay motors another chance for car sales. 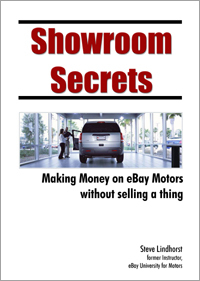 Steve’s latest ebook (Showroom Secrets) explain in details how to use your eBay selling skills to make full time living selling cars. The ebook covers every thing from learning how to sell cars, to the preparations for getting deals with car dealers in your local area. Steve is a former eBay University instructor with an excellent experience with cars and car dealers, As you read the ebook, you will go through details for everything you need to know to start listing dealer vehicles, and making money.